southern orders : UNFORTUNATELY THIS BEFORE AND AFTER HAS NO AFTER AFTER THE AFTER! UNFORTUNATELY THIS BEFORE AND AFTER HAS NO AFTER AFTER THE AFTER! Thanks to the Egyptian for these photos! These are from a church in Ohio! I wonder if the liturgists and priests who abused this church abused kids and vulnerable adults as well? How many laity were outraged at this and became ambivalent towards the Church because of this? From worshiping our Lord to worshiping a pipe organ, way to go. The priest who did this must be a major league jackass. There is a Freudian element there if you know what I mean. not only that but it destroyed the acoustics, if you click on the after pic and then enlarge you notice the organist not 4 foot from the altar, the choir is off to the left. The cantor is right behind the organ console, What is left of Mary is way off to the side and St Joseph fled, hopefully looking for help, and the statue of the patron St Henry is in the entrance to the basement meeting rooms overseeing crowd control patiently waiting to return, it is a beautiful church on the outside and a total disappointment on the inside, Just the value of the artwork covered up is sickening. I have heard others speak of this mainly for the ‘Risen Christ Victorious’ above the altar. That is very popular among some of the clergy that pilot renovations in other parishes of our diocese. I can see its appeal but it seems sort of pagan, actually. Other readers may like to know that this area -- Egyptian and I are in the same general area, although I don't know that we've met -- is filled with beautiful churches like this. Lots of them escaped wreckovation mostly unscathed, and some are being restored, such as mine (by my predecessor; I can take no credit). Still others are being renovated in a true sense -- because restoring what was lost is, alas, beyond the immediate capacity of many congregations. In a parish I pastored previously -- not far from here -- that was the situation with the artwork on the walls. We simply could not have restored that look, so we did something different. Happily, a later generation could restore it -- what we did was an improvement, and doesn't forestall a fuller restoration. I am proud to say that while I was there, we were able to install beautiful floors -- wood and tile -- that were far better than the linoleum that was there in the mid-20th century. When we installed the new floors, they replaced carpeting. Now that church will not need new flooring for 100 years. Overall, there is a positive trend at work as new priests arrive in the area. In some cases, alas, the old buildings are simply gone, and churches built in the last few decades are mostly not pleasing structurally. Still, recently arrived pastors are trying to make the best of them. The most recently built church in this area was reasonably well done as a structure; the pastor had to work within certain strictures imposed by the diocese. There is one of those silly baptismal pools, and he wasn't allowed to have the tabernacle in the main body of the church (since rectified). 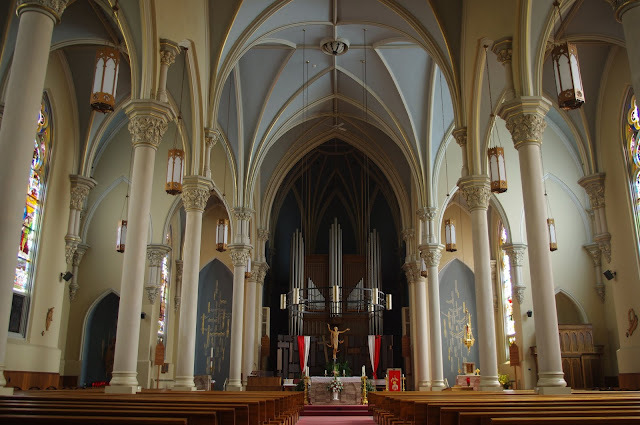 There are certain other oddities of the church that may be the fault of "downtown" or else of bad judgments locally, but they (mostly) can be fixed in the future. The one thing that probably will never be fixed has to do with the shape and design of the ceiling -- it is too low and has exposed joists -- and I wonder if that was a function of cost. The old vaulted ceilings are beautiful in every way, but they do create many financial headaches. The Egyptian is 100% right about the chapel at (the former) St. Charles Seminary. I always feel better about the Church's future after you post. Oddly I can understand why the paintings in the sanctuary weren't replaced.Often they are a type of wallpaper that might have deteriorated on a closer inspection. To have artists repaint them might have been cost prohibitive, and in the art world when a painting cant be fully restored the areas that could not be completed are often painted in a bland neutral shade. It makes things easier for a future restoration artist. 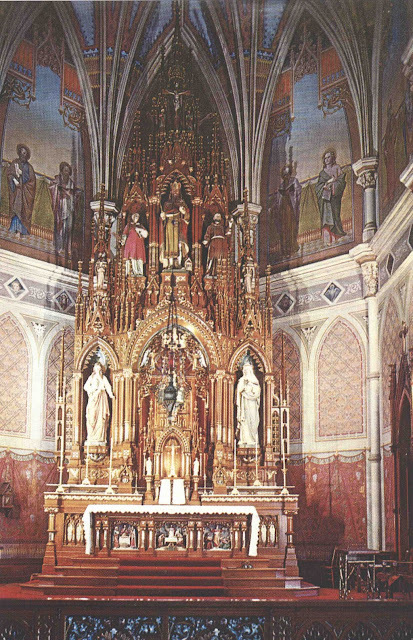 What I can understand is why they got rid of that marvelous wooden altar. 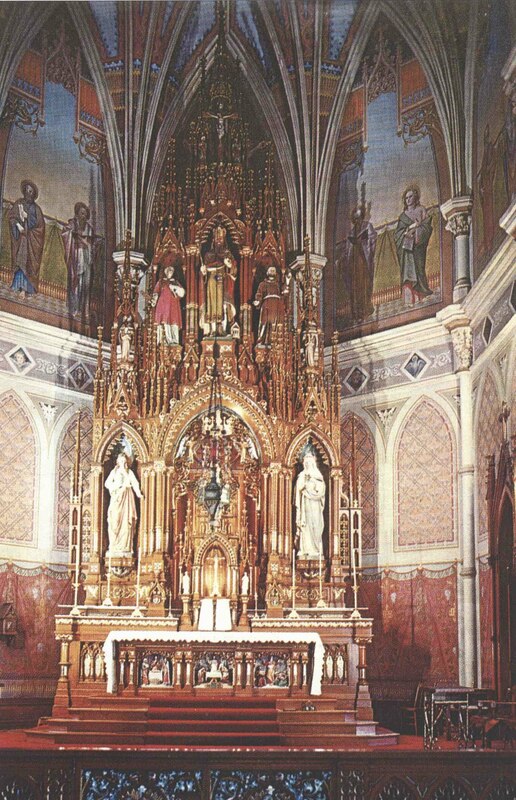 Simply putting that back (with its equally beautiful altar rail) would be a 1000% improvement. It was a lefty, loon cleric exercising his clerical privilege that got the altar tossed in favor of a Cranmer table. Lots more could be given. To my eye, these all seem to begin with the same basic plan. I can imagine the same two or three architectural firms may have built them, but I don't really know. Not that I'm complaining. They are a familiar and welcome presence in the landscape. All these churches tend to be only miles apart, and if you want to, you can make a tour. The doors are almost always open during the day if you want to make a visit. St. John the Baptist is a gem - too bad the communion rail was taken out. Other than that, a standout. Thanks for posting. While there's nothing wrong with the exterior of our church, it is not in the same elegant class as so many of the churches around here. Our interior is in good shape, again, thanks to my predecessor.